Centre Forward and to force long shots. For this defence you need a good goalkeeper (espically long shots). The defenders 2 and 7 must Full Press and be in passing lanes. 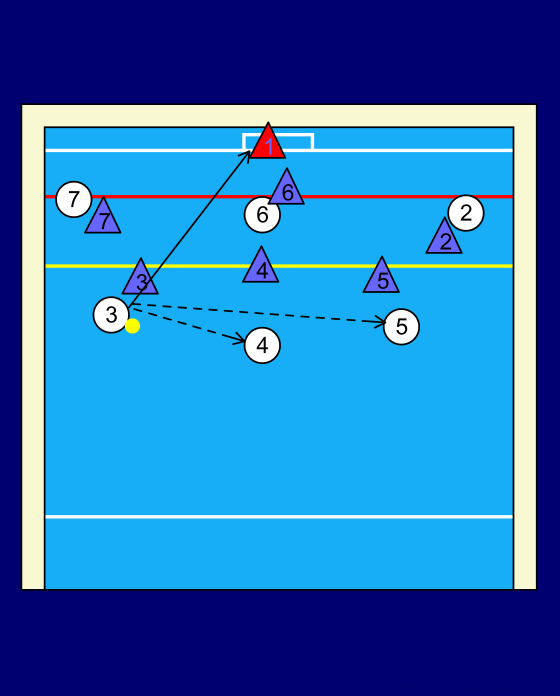 Defenders 3,4,5 are the dropping defenders to steal the ball if it is play in, to assist goalkeeper in blocking shots. Defenders 2 and 7 are full press in passing lanes. Defender is closing down attacker 3 with arm raised to cover near corner shot! Defender 4 is back covering the pass into the centre forward. Defender 5 is still covering fairly close to attacker 5 to stop cross pass. Defenders 2 and 7 are full press and in passing lanes. Defenders 3 and 5 are dropping back to help centre back.Defender 5 drops a little further than defender 3. Defender 4 is moving up to close down attacker 4 and blocking the shot to the goalies right. If attackers 3, 4, and 5 are pushed out to far DON'T follow them as it will be to hard to help the centre back out. Defender 3 is fairly tight to stop the quick cross pass. Defender 4 is dropping back to stop pass into centre forward. Defender 5 is moving out and blocking the near corner shot.